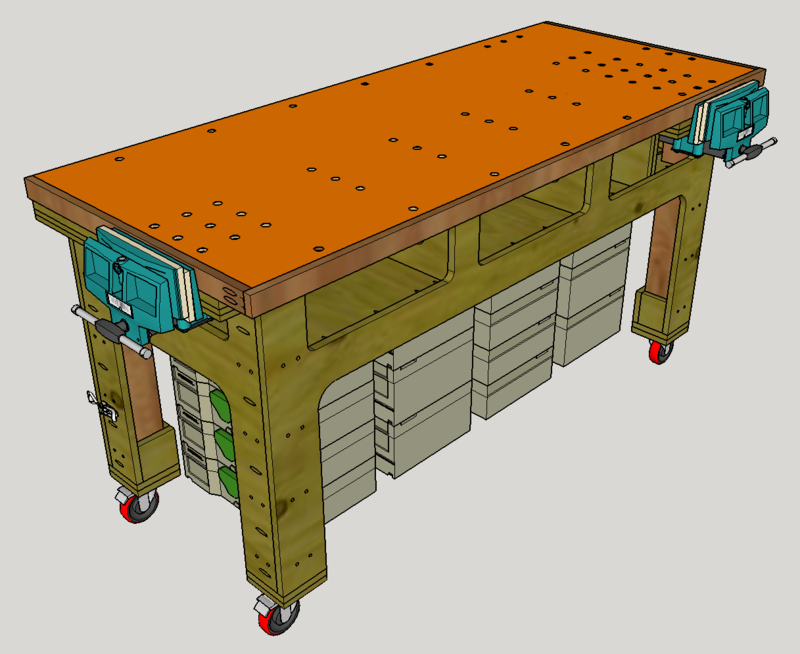 This page documents my plans for a new woodworking workbench. The bench is a torsion box design, and each side is a contiguous piece of plywood to prevent racking. It is on casters with combined wheel and swivel locks, so it will stay put when locked. There are openings in the torsion box to store tools that I'm using, and I might put one of my wood screw containers in it as well. There is room underneath for my tool Systainers, which are on Festool carts. Both of the vises are Wilton 79A vises at the moment, but it's possible that I'll change the end vise to something more typical of an end vise. For the moment I have some draw latches on the back legs so that I can attach the bench to another bench if I ever need more work space.